Meatless Monday, Lent Friday or any night of the week, below are some of my favorite dinner recipes. Bonus, some of these make multiple servings, ideal for families, those who like leftovers and those looking for meal prep ideas. Homemade veggie burgers are tough. They fall apart, they require too many ingredients, and I had yet to find a recipe that I thought tasted really good. This one kicks all those issue to the curb. I’ve found pinto beans work best but I’ve experimented with black beans, chickpeas, and combos of both – all taste great. As for the quinoa and rice, you could cook each separately – but let’s be real. Uncle Ben’s prepackaged Quinoa Rice flavor is so much faster and it’s oh-so tasty. You might be thinking to yourself, “Why would a vegetarian love tacos?” These are why. I’ve tinkered with this recipe and found a combo that I love – plus the real secret, the avocado and greek yogurt base. 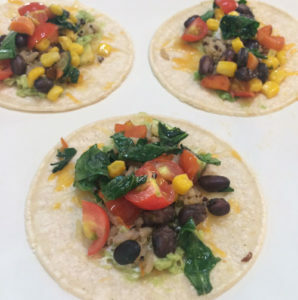 If you’re looking for a different twist on Taco Tuesday (sans tacos), try this recipe as-is, only instead of adding the mix to tortillas, pour it over a sweet potato, cooked and cut in half, to create Veggie Taco Boats. This also works great as topping on tortilla chips with melted cheese. Greek Yogurt – a couple tsps. This is probably my all-time favorite meal I’ve ever learned to cook. It’s crazy-healthy and delish, thanks to all the veggies and adding tofu gives it a solid dose of protein. I omit noodles and instal serve it on a bed of brown rice with quinoa. Prepare tofu by draining, blotting out excess water with a paper towel and slicing into small cubes. Save the other half for your next meal – it’s just as delish reheated! Got a craving for Mexican and Italian? Gotcha covered. Mexican Pie-zas perfectly combine both the flavors of a quesadilla and a pizza. What I call a win-win.. Cool, then top with avocado or sour cream if you like – or just eat as-is! Last winter, one of my BFFs, Jenny, invited me over for some Friday night wine and girl talk. She also introduced me to something that has become one of my favorite, easy meals: lavosh. This light, crispy food resembles pizza, just without the marinara sauce and swapping pounds of mozzarella for Havarti cheese. It’s super easy to make, fast and you can’t do it wrong. You can put anything on it, whatever toppings you want. Bonus, it’s a great way to use up meat and veggies in the fridge that are on the cusp of going bad. Don’t throw em out, clean out the fridge and make lavosh (hence the name of this meal, coined by Jenny). Cool a couple minutes then enjoy! Fine, it’s Chipotle. I stole this idea from Chipotle. But the Muscle Egg part was my idea! There’s a restaurant we all love that makes the yummiest of yummy burritos. Because the line is always out the door and one burrito there is filling enough for a family of four, I’ve created a copycat version that adds a protein punch without messing up the taste – thank you, Muscle Egg! But the real secret to these: the Cilantro Lime Rice. For a unique twist, I’ve subbed the beans for baby reds or sweet potato – both excellent and great for mixing it up! A few years ago, after a particularly bountiful garden at my parent’s farm, my mother gifted me with spaghetti squash. I instantly fell in love with this yummy pasta alternative and all the different ways one could cook it. Since, I’ve realized one can make zucchini into ribbons or noodles and enjoy the same way. The recipe below can be changed up to incorporate your favorite veggies, or if you prefer plain with marinara, pesto or Alfredo sauce. *Note: I rarely eat zucchini noodles on their own. Most of the time, I’ll make a plain serving then combine them with either tortellini, whole wheat spaghetti noodles or a carb like a sweet potato. Other times, I’ll take a serving of leftover pasta, then add them in to spice it up and add a fresh twist.